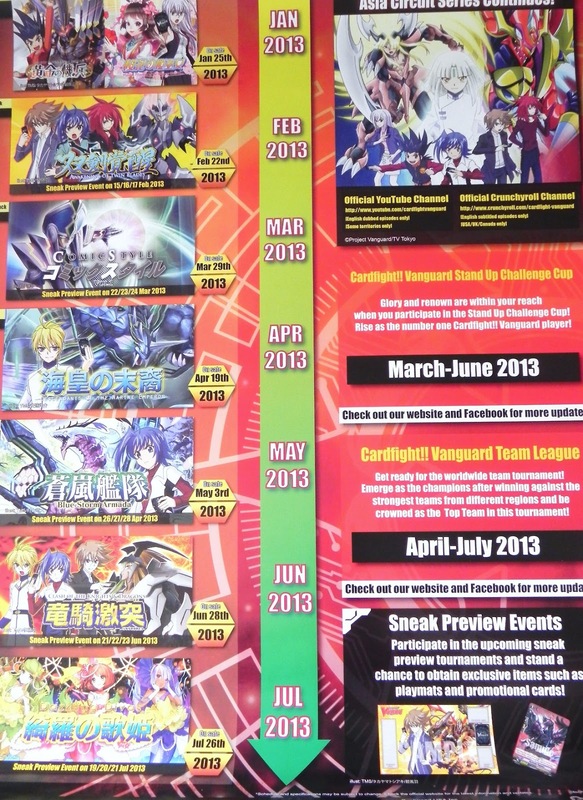 Recently-released posters have set out a much-awaited schedule for 2013's tournament season, as well as a schedule for booster set releases. In addition to these, dates for sneak preview events have gone up, providing exclusive chances at getting playmats, promo cards and early access to new cards. A singles tournament whose victor will "Rise as the number one Cardfight!! Vanguard player." This is currently speculated to be WCS2013; the four month time frame presented matches up with that of the 2012 world championships. If this were the case, then it's possible that the schedule will parallel 2012's closely, with the Indonesian, Australian, Philippine and German national tournaments taking place in March while the tournaments for France, Great Britain, Singapore, Hong Kong and Japan take place in April and the North American championship runs concurrent to the others, extending into May. If this were the case, the world finals would be in early June. However, there may be more participating countries than in the previous year. Within the time frame of the tournament, BT05 will be usable from the beginning, while EB01 will become available in late March, TD07 will become available in the tournament's second month, and BT08 will be made available during its third. BT09-onward will most likely not be usable before the end of the tournament, based on its late release date. This means that the major players during the Stand Up Challenge will likely be Dragonic Overlord The End, Majesty Lord Blaster, Scarlet Witch CoCo and Goddess of the Full Moon Tsukuyomi. Notably, Aqua Force is projected to have a very slim window to appear within; its first opportunity to take a tournament title will probably be at a stage when only trial decks are available. A worldwide triples tournament that will pit the strongest teams from different regions against one another to select for the globally strongest team. This tournament being confirmed as a global one strongly implies that the Stand Up Challenge is an international event. Due to the timing of the tournament, it appears that it will not interfere with the Stand Up Challenge Cup, possibly allowing for dual participation in both tournaments. Note that Fighter's Road 2013 will be starting up in May and ending in July, concluding in the same timeframe as the Team League. This is similar to how the 2012 international cup and Fighter's Climax 2012 were structured, with WCS2012 starting up a month earlier but ending in the same month as FC2012. BT05, EB01 and TD07 will all probably be available at the start of the Team League, with TD07 having the most room to be excluded. Within the first three months of the tournament, every set listed below with the probable exception of BT09 and definite exception of EB06 will be made available. Will provide the opportunity for fighters to receive a The End playmat and Darkside Pegasus promo card. Reinforces Royal Paladin, Shadow Paladin, Kagerou, Dark Irregulars, Pale Moon, Nova Grappler, Oracle Think Tank and introduces Murakumo and Neo Nectar. Reinforces Royal Paladin, Murakumo, Pale Moon, Nova Grappler, Kagerou and Megacolony, and introduces the Exculpate the Blaster promo card for Royal Paladin. Introduces Aqua Force to the English pro scene. 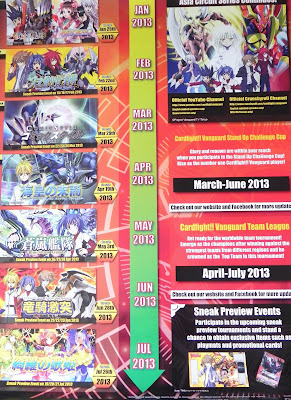 Reinforces Aqua Force, Neo Nectar, Narukami, Great Nature, Dimension Police and Tachikaze. An all-star set which reinforces Gold Paladin, Narukami, Aqua Force, Angel Feather, Oracle Think Tank, Nova Grappler, Murakumo, Great Nature, Pale Moon, Royal Paladin and Shadow Paladin. An extra booster dedicated wholly to Bermuda Triangle, much in the style of EB02: Banquet of Divas. The set will feature Eternal Idol, Pacifica as a major card, succeeding Top Idol, Pacifica of EB02.